If your fiscal year is the calendar year, do nothing. 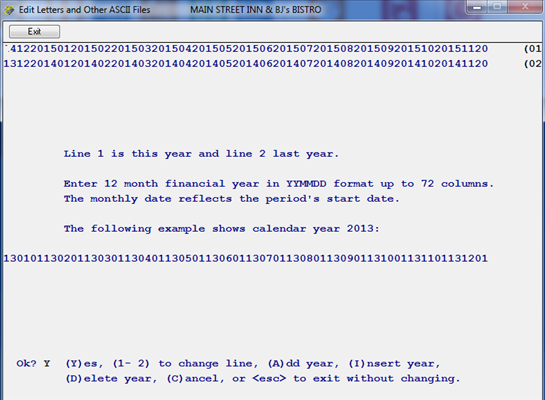 If your fiscal year is not the calendar year, remember to edit the GLDATE file. There are several ways to do this. 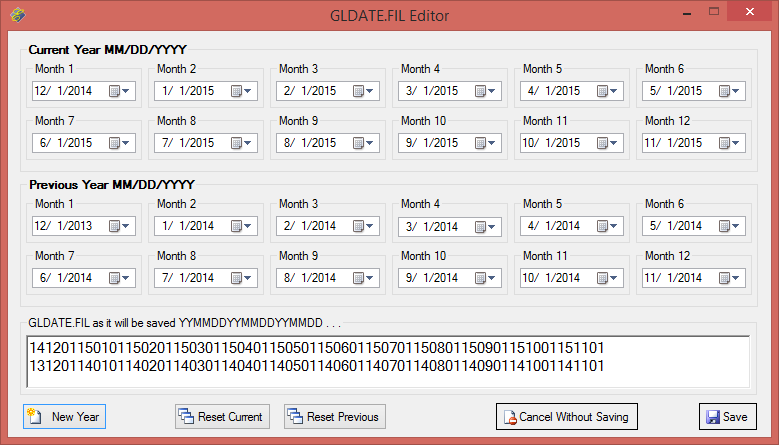 If you are on a current version of Execu/Suite go to File > Special > Edit GLDATE file. You will see the following screen. This is where you make the changes. Remember to save your changes. Click New Year to create a new "Current Year". This will take the existing "Current Year" and move it to the "Previous Year". A new "Current Year" will be created by adding 1 year to the values that exist now. After this is done, you can make any modifications to the new "Current Year" then save it. This button will create a new "Current Year" using the date in "Month 1" as the beginning date and adding 1 month at a time to that date to complete the year. For example, if you were to set "Month 1" to be 12/17/2014, the rest of the new "Current Year" would look like this. This button performs the same function as "Reset Current" except that it modifies the dates for "Previous Year." 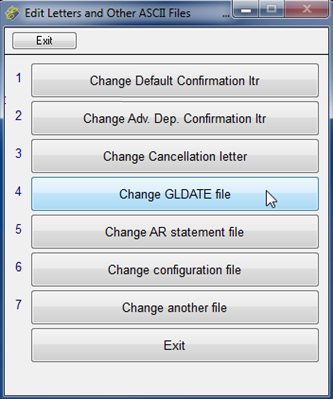 This button will cancel any unsaved changes and exit the program. This button saves any changes. 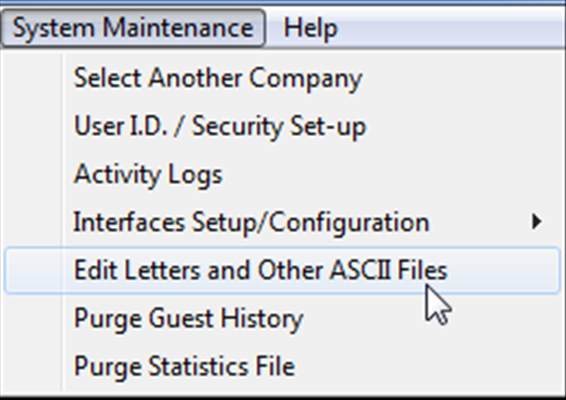 If you are on an older version of the software go to System Maintenance > Edit Letters and Other ASCII Files > Change GLDATE file. The current year goes on the top line. The prior year goes on the second line. In the above example, the first period of the current fiscal year begins on December 20, 2014 and the last period begins on November 20, 2015. The first period of the prior fiscal year begins on December 20, 2013 and the last period begins on November 20, 2014.